Anyone can tell you if a trailer "looks good" or not. But Drew Magary, who spent over a decade working in advertising, is here to tell you whether or not a trailer WORKS. This week's trailer? "Brave"
Even though everyone hated "Cars 2: Larry The Cable Guy Is A Spy, Y'all!," it may shock you to learn that the sequel actually out-grossed the original when international grosses were included, proving once again that children have awful taste. So there isn't as much pressure on Pixar's next film to succeed as you might think, given that the company is still printing cash. However, the studio is still counting on "Brave" to get back in the good graces of critics. Can their latest offering (complete with first female lead!) do the trick? Let's have a look at the brand new trailer and answer a few questions. Does the trailer let us know what the movie's about? Not really. Everyone is Scottish, that much I know. I bet Mike Myers makes obscene phone calls to the studio every day to punish them for not giving him a part. All you can tell from the trailer is that the red-headed girl is some kind of king's daughter who must go out on a quest to prove that Scottish lasses aren't all about stee-ing hoom and meeking haggis far the wee ones. Also, she has a bow and arrow. PIXAR'S GOIN' ALL HUNGER GAMES ON YOU. HOLY SMOKES IS MEL GIBSON VOICING A CHARACTER IN THIS MOVIE? Nope, that would be actor Kevin McKidd, who sounds an awful lot like our favorite DUI perp. In fact, that's just one of the many ways this trailer echoes Gibson's "Braveheart." From the breathtaking mountain vistas, to the bearded warriors, to the earnest talk of freedom ("Are you willing to pay the price your freedom will cost? 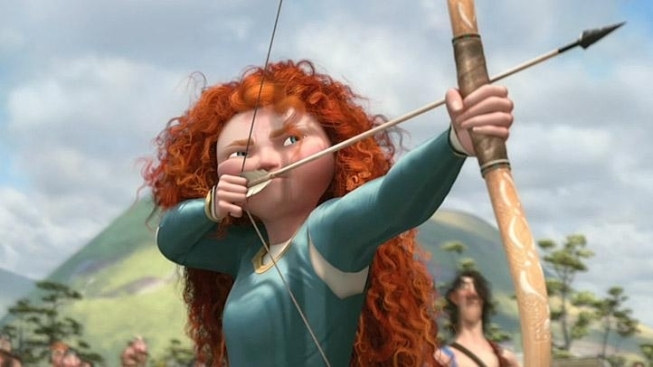 "), to the freakin' TITLE, "Brave" feels an awful lot like a "Braveheart for little girls" pitch. It's not a bad pitch, mind you. But if the little redheaded girl is disemboweled at the end, I'll cry out RIPOFF and demand my money back. Are there bears? There are! GODLESS SCOTTISH KILLING MACHINES. Just how Scottish IS this movie? Well, you've got Billy Connolly doing the opening monologue, plus you have lots of shots of something that looks like Stonehenge (which is actually located in England, but has a Scottish feel to it), plus you have Craig Ferguson as the comic relief. It's like a two-minute Renaissance Festival. Does this trailer work? Yes, but only because of the PIXAR logo that precedes it. Everything that comes afterwards feels awfully familiar, from the storyline (girl power!) to the goofy sidekicks. This looks very much like a Disney movie run through the Pixar gauntlet. I'm not wild about it.